Why is it that you shouldn’t give them treats on empty stomachs? I also like your tip about feeding a dog first so he’s not hungry and therefore he’ll be less likely to inhale/swallow the treat whole! Don’t give your dog treats INSTEAD of food. Don’t give your dog too many treats in one day. I took this photo about two seconds before Jimmy pooped on me. One of the hazards of raising fowl. Jimmy would love the Weird Al concert. 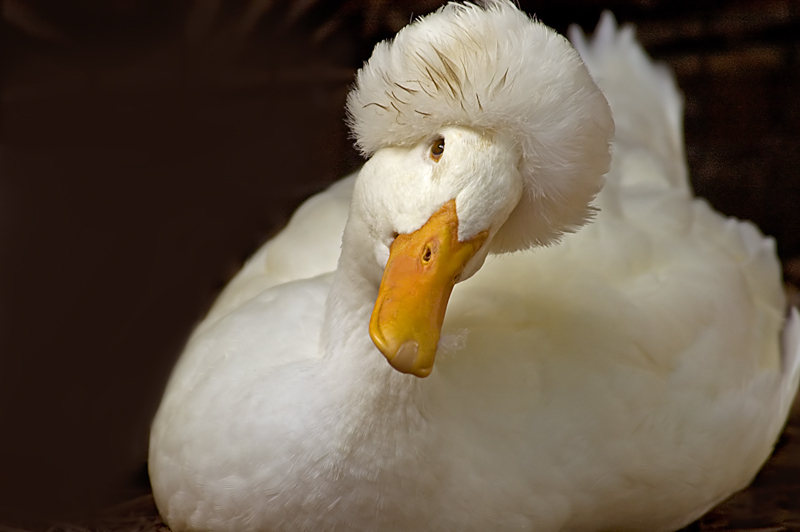 He would probably quack up at the antics. Has he ever considered trying out for the Aflac duck spot? He would be great! 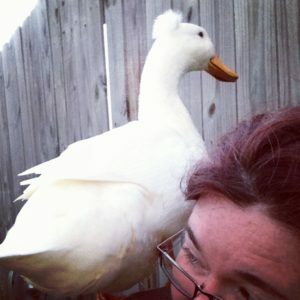 Does your duck have a mohawk? Is that tuft on the head a common thing particular type of duck or just a Jimmy thing? Where does Jimmy live in winter? With the chickens? Interesting questions. Jimmy probably wouldn’t like the concert. He’s a little phobic about crowds. Maybe I should talk to Al about a private concert, though, since Jimmy’s favorite song is I Want a New Duck. And no, he refuses to try out for Aflac. That would mean moving. Jimmy takes his current job very seriously, guarding the chickens. They would have to come, too. Ain’t happenin’. This photo is from TrekLens site. A very handsome example of a crested Pekin, which is probably what Jimmy is. The box baby Jimmy was in just said Assorted. Some crests are so full that they obscure vision. And look silly. Jimmy’s crest is tame. It’s not a breed specific thing. More like having blue eyes versus brown eyes, I think. Winter? All year round the duck and chickens sleep in a coop. Well, I don’t think Jimmy sleeps in the coop. He has always slept UNDER the coop in his pine shavings. We’re building the new coop off the ground so he can sleep under it. Y’all come back next week and I’ll announce the winner of the DVD! And have another contest! You didn’t know about this week’s contest/giveaway? It’s not too late! Go leave a comment! P.S. Jimmy LOVES Jones Chicken Taffy!